If you are a working mom (or dad) and have yet to arrange for summer kid coverage–news flash—it may already be too late. Last week I bumped into a sitter whom I’ve used on occasion and relied on last summer, and she is already fully booked for the entire summer! Luckily, our 5-year-old son, Huxley, is covered. His preschool continues to run through the summer without interruption (thank gawd). Our daughter, Hazel, age 10, is a different story. Last year we enrolled her in a very large summer camp. The projects and outings looked like a lot of fun on paper, but we had no idea there would be more than 150 children jammed into this program—not to mention the demands of the strict drop-off time of 8:30 a.m., no exceptions. Frankly, the camp was an institution: no comfy couches, no freshly baked goods as a morning snack, no grandma-like caregivers to make handmade doily art, and no tea parties. All I felt last summer was guilt. I often reminisce about my own summers as a child. I recall waking up on warm summer mornings and just gazing out my window and planning my day. My mother was a stay-at-home mom, so on most days there was no set agenda. Actually, I often remember feeling bored. In typical kid fashion, I didn’t realize how much of a luxury this truly was. Nowadays, as times have changed, everyone is constantly on the go; with sports, camps, meetings, commitments, commitments, commitments! Where have the simple days of summer gone? You know, the days when you could just hop on a bike with a sandwich in your knapsack, see-you-when-the-streetlights-come-on kind of days? I know the world has changed, and safe havens (where you don’t have to constantly worry about your kid’s whereabouts when you send your kids off to play) are few and far between. I feel fortunate, though. Every summer, for two weeks, our family heads out to our family camp in the wild and rugged Swan Valley of Montana, nestled in the Rocky Mountains. This is the closest feeling to blissful freedom that our children experience. 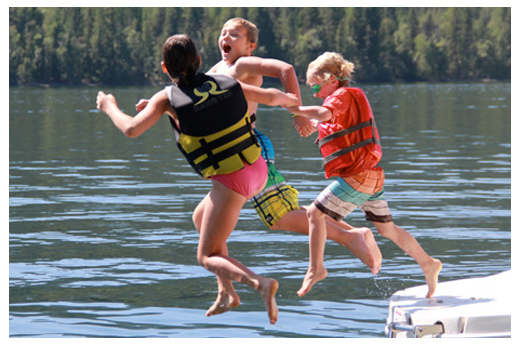 At a glorious lake in the mountains, our kids run around from cabin to cabin with wet-lake hair and scraped-up knees, simply enjoying summer life, with no agenda. But, I digress. Back to my current summer camp dilemma: Rather than enrolling Hazel in a monster summer camp institution, we decided to spice it up with eight different summer camps ranging from pottery, to jewelry, to beach volleyball and surf camp. Though the convenience of a set schedule is lost, I feel we are investing in her future and in her summer experiences that, I know, will last a lifetime. The most important part of summer is having fun. Summer fun is not just for your children, but for you, too! You don’t need to break the bank in order to enjoy your summer break, either. You can have a simply splendid summer on a shoestring budget if you put your imagination to it. Like camping in the yard or setting up a porch cabana/fort complete with outdoor movie theater (Mommy’s laptop) and simply sleeping outdoors. Or you can load up your car and camp close to home—preferably at the beach or somewhere with a pool. This way, the kids are entertained while you have some much-needed “me time.” I like to visit a local farm and harvest fresh fruits and vegetables to create a special (and sustainable) dinner with my pickings. This is a great way for kids to get a better understanding of where actual food comes from and what goes into creating the final product they know as dinner. There are so many things you can do to make you feel far from home and out of your daily routine. No matter how you choose to spend your summer, try to recall your days as a kid—the simple summer days. Get wet (swimming lessons if needed). Dress up in playful clothes. Create things, preferably from recyclable finds. Eat summer foods like watermelon or grilled corn on cob. Karen Stewart cofounded Stewart+Brown with her husband Howard Brown in 2002 and oversees all design and production activities. Prior to Stewart+Brown, Karen was senior designer at Patagonia and J.Crew. She began her design career at Urban Outfitters, Free People, and Anthropologie, designing their most popular collections. 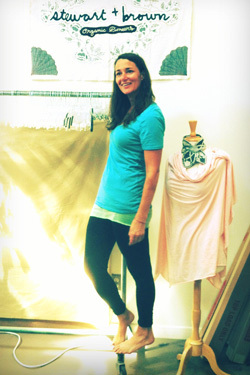 Karen has cemented her place as a leader in both fashion and lifestyles of health and sustainability (LOHAS) circles. She actively serves as an advisor to Teens Turning Green and as a mentor to Otis School of Art and Design, and is a speaker at many conferences, including Women in Green and Women of the Green Generation. Karen holds a BFA in painting from Maryland Institute College of Art.